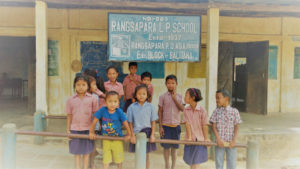 Rangsapara, the cleanest village in Assam. Open defecation-free Garo village, Rangsapara in Goalpara district of Assam is not only the state’s cleanest village but is also free from alcohol and drugs. The village has never witnessed any crime in at last 17 years, which makes the village a model not only for the state but for the entire country. The Village had started its journey towards cleanliness and peace from 1999. Roberth John Momin, the village head and also one of the initiators of the project said that the village has also taken a pledge to be plastic- free from this month and is also planning to become the first village in the country with a cashless economy. “The arrival of the Swachh Bharat Mission-Gramin was a blessing for the place. The mission came to the block in the year 2014 and with its help and also with efforts of Public Health Engineering Department (PHED) the villagers began to have pucca toilets,” said J V N Subramanyam, Deputy Commissioner. Rangchapara was declared the cleanest village in the state for the year 2016-17 by the Public Health Engineering Department (PHED) last month and also received a reward of rupees five lakh from the CM Sarbananda Sonowal. The village was selected by Omeo Kumar Das Institute of Social Change and Development – a third party which examined every village in every district on the basis of criteria including attempts to become ODF(Open defecation-free), pucca toilets and their condition, attempts to promote awareness on cleanliness amongst others. “It was in the year 1999 when the village people began talking about cleanliness and in 2000, we formed a 10-member committee, which was headed by me,” said Momin. “The committee has taken four resolutions – to be a peaceful and united village, to be a clean village, to have toilets in every household and availability of clean drinking water for all,” he said. The village with 88 households – all Christians – since the formation of the committee did not see any case of open defection, violence or anyone consuming drugs, alcohol or smoking. “We have imposed a fine of Rs 5001 if anyone found not following the resolutions, but the best part of our steps is that the fine was never required to be imposed on anyone,” said Momin. The villager’s intention was to make their village clean, however, the fame and reward that followed were a surprise to them. “The villagers also have a proper waste management system. You can find dustbins after every few steps and they dispose of biodegradable and non-biodegradable waste accordingly,” said Abdul Mozid, Senior Block Development Officer, Balijana Block. The village has two schools – one primary and another middle. The people are neither very rich nor are highly educated. The muddy road which connects the village to the district is also not in a very good condition and the 108 ambulance service refuses to ply in the village. “We have been demanding for the money since 2014, but no money has been granted. It is a very serious problem,” said Ratna Nath, Panchayat President Balijana Block. The steps to be the cleanest village has not only helped the villagers to get the reward but has also reduced the number of children falling ill in a population of 475. “People are now connecting health with cleanliness, which has also helped in reducing the number of diarrhoea cases to half. The village is a perfect example of what people and government can do together,” Subramanyam said. “The village is now a brand and is helping in bringing changes in the nearby villages. People began to follow its path to be not only clean but healthy as well,” he said. The main profession in the village is agriculture, and only seven people are in government jobs. Most of the houses are kutcha, but with the help of the Indira Awas Yojana, they began to have a plastered house made of bricks. Comment On Rangsapara, the cleanest village in Assam. We from Dronacharya Academy, Barpeta Road are planning to visit Rangsapara for a field study of our students of Anthropology. Can I get contact no. of the Village Headman Mr. Robert J Momin. Kindly call at 9706721484.